There haven’t been any extension talks between Justin Verlander and the Astros front office, the right-hander told reporters, including MLBcom’s Brian McTaggart (Twitter and video link). “I don’t know what their organizational plans are. It’s something I wouldn’t be opposed to….we’ll see what happens,” Verlander said. It isn’t necessarily surprising to see a lack of negotiations between the two sides at this point, since most teams wait until their offseason business is complete and Spring Training begins before turning focus to extending in-house talent. Still, there is some urgency in Verlander’s case, given that 2019 is his last guaranteed year under contract (he agreed to waive a possible vesting option for 2020 as part of his trade to Houston in August 2017). Verlander is coming off one of his finest seasons, a campaign that saw him finish second in AL Cy Young Award voting after leading the league in both K/BB rate (a career-best 7.84) and strikeouts (290, another career high) while posting a 2.52 ERA over 214 innings. There certainly doesn’t appear to be much evidence that Verlander is slowing down, even though he turns 36 in February. There also haven’t been any long-term contract talks between Carlos Correa and the Astros, the shortstop tells the Houston Chronicle’s Chandler Rome. Persistent back problems limited Correa to just 468 plate appearances in 2018 and a .239/.323/.405 slash line, easily the worst of his four MLB seasons. “For me, right now is not the time to talk about [an extension],” Correa said. “Obviously coming off the injury last year and the down year. I’m looking forward to bouncing back this year, be the player I am and we go from there.” The first step is an arbitration hearing between Correa and the Astros on January 31, with Correa submitting a $5MM salary figure for 2019 and the team counting with a $4.25MM offer. This is Correa’s first of three years of arbitration eligibility, so there is still plenty of time for the two sides to eventually work out a longer-term deal once Correa feels he’s coming off a better platform year. White Sox GM Rick Hahn said he would “be personally disappointed” if the team didn’t sign Manny Machado or Bryce Harper, though he told MLB.com’s Scott Merkin and other reporters that the mere pursuit of such top-tier stars represents a new stage of the team’s rebuild. “The fact that we are now sitting here in a potential position — or at least in a position where, if we don’t convert, people are going to be disappointed — I think is an important step forward for this organization,” Hahn said. GM Rick Hahn checked one box off his offseason to-do list with yesterday’s acquisition of starter Ivan Nova. While it’s not a landscape-shifting move by any means, it’s an important one for the White Sox, who have Nova earmarked for the innings originally allocated to top prospect Michael Kopech, per James Fegan of the Athletic (subscription link). Nova should provide reliable, if unspectacular rotation innings, much in the mold of James Shields, though Nova isn’t quite the innings-eater that Shields is (Nova’s career high in innings is 187 in 2017). Nova, with Scott Boras client Carlos Rodon, Reynaldo Lopez and Lucas Giolito, should make up the front four in the Sox 2019 rotation, with the fifth spot an open competition between Manny Banuelos, Dylan Covey, Jordan Stephens and perhaps a couple non-roster invitees. Hahn remains on the lookout for further rotation help, but with at least one more rebuilding season ahead, the White Sox have the luxury of patience as they continue to audition young arms for what, they hope, could be an earnestly-competitive roster by 2020. Hahn is also on the lookout for a short-term catching option to add to the 2019 mix after dealing Omar Narvaez to Seattle. Their interest in Yasmani Grandal must be grouped, at present, with Machado and Harper as guys the Sox are kicking the tires on, but unlikely to lock down. They have a pair of catching prospects in Zack Collins and Seby Zavala, but there’s no reason to rush either one when one-year stopgaps like Martin Maldonado or James McCann are available, whom the Sox could happily pair with Wellington Castillo for the time being. Collins and Zavala don’t preclude a Grandal acquisition, as the latter would take some pressure of the pair of prospects, though it’s reasonable to assume Grandal’s market could see an influx of suitors when the J.T. Realmuto sweepstakes reaches a conclusion. If this is it for Jaso, the 34-year-old will be hanging up the spikes after 2591 career PA over parts of nine seasons with the Rays, Mariners, A’s and (for the last two seasons) Pirates. Injuries and struggles against left-handed pitching limited Jaso’s usage as an everyday player, though he was very productive in various part-time capacities. Jaso posted good career splits against right-handed pitching and was an above-average run producer overall in six of his eight full seasons, finishing with a 115 wRC+ for his career. If this it for Jaso, we wish him congratulations on a fine career and we tip our hats to his most immediate postseason endeavor — helping with relief efforts in Puerto Rico. The Tigers have asked the Rays about third base coach Charlie Montoyo, FanRag Sports’ Jon Heyman reports (Twitter links). It’s hard to know where Montoyo sits on the Tigers’ list of managerial candidates due to the sheer number of names in their search; according to Heyman, Detroit began the process with around 50 names under consideration. Montoyo, who has also drawn interest from the Mets, has been Tampa’s third base coach for three seasons and a manager at all rungs of their minor league system from 1997-2014. Matt Carpenter won’t require surgery on his right shoulder, he tells MLB.com’s Jenifer Langosch (Twitter link). An MRI revealed only inflammation in the shoulder, which has been a nagging concern for the Cardinals infielder. Possibly due to the injury, Carpenter saw drops in his batting average and slugging percentage from his previous two seasons, though he was still quite productive, hitting .241/.384/.451 with 23 home runs over 622 plate appearances for St. Louis. Earlier today on MLBTR, we checked in with more notes from both Central divisions, including items on the Royals, Indians, Cardinals and Tigers. Earlier this summer, the White Sox extended the contracts of executive vice president Kenny Williams and general manager Rick Hahn, USA Today’s Bob Nightengale reports in the course of a lengthy interview with long-time club owner Jerry Reinsdorf. Precise terms are not known, but both have received new long-term deals, per the report. Reinsdorf also discussed the organization’s current rebuilding efforts in a piece that’s well worth a full read. Both executives are longstanding members of the organization. Williams played with the White Sox, joined the club as a scout in 1992, and has steadily climbed the ranks ever since. He took the GM seat in 2000, helping to engineer the club’s 2005 World Series-winning roster, and left it with a move further upstairs twelve years later. Hahn took the baton from Williams as GM in 2012 and has held that role since. He originally joined the South Siders when Williams took over the baseball operations, moving to the organization after a stint as a sports agent. He quickly rose to become the assistant GM and was long seen as an eventual successor. In recent years, that pair of top baseball decisionmakers oversaw the construction and then dismantling of a strong core of young talent. High-end, controllable players such as Chris Sale, Jose Quintana, and Adam Eaton seemingly gave the club a chance at a nice window of contention, and it spent big on complementary veterans (through trade and free agency) to put a winner on the field. Those efforts failed to come to fruition, though, and the Sox haven’t posted a .500 record since 2012. With evident needs all over the roster after a disappointing 2016 campaign, Reinsdorf authorized a dedicated sell-off. Sale and Eaton were moved in successive Winter Meetings blockbusters. Quintana went this summer to the cross-town Cubs. And ensuing deals saw David Robertson, Todd Frazier, Melky Cabrera, and Tommy Kahnle swapped out for young talent. Since embarking upon this new path, the White Sox have compiled one of the game’s top farm systems. In addition to the numerous youngsters added via trade, Chicago inked highly rated Cuban prospect Luis Robert and is on course to score a top draft choice next year. The club’s most intriguing new assets litter top-100 prospect ranking lists, and several — including Yoan Moncada and Reynaldo Lopez — have already earned promotions to the majors. Turning that aggregation of young talent into a successful MLB roster, of course, will still require a concerted effort. The Sox currently own an ugly 45-71 record and will face many challenges in player development and, eventually, further roster maneuvering designed to supplement the hoped-for new core. More immediately, the team’s top decisionmakers will need to consider trades involving players such as Jose Abreu and Avisail Garcia, each of whom has played well this year and can be controlled for two more seasons via arbitration. There’s mostly a blank slate on future salary commitments, though, which will surely aid the undertaking. After pushing payroll to north of $130MM by the end of 2016, the front office has pared things back to the point that the recent extension of shortstop Tim Anderson stands as the only significant remaining long-term commitment. The departures of Chris Sale and Adam Eaton haven’t led to more trades of veterans for the White Sox, though GM Rick Hahn won’t rush the rebuilding process, he tells reporters (including CBS Chicago’s Bruce Levine). “If we had our druthers, we would continue to make transactions like the Eaton and Sale deals in rapid succession,” Hahn said. “Our desire is to get through this process and build a sustainable core of talented players as soon as possible. Our desire and impatience is not going to dictate this market and the schedule of these moves. The timing of these moves will be based upon the market and our ability to get the right value in these trades.” Hahn said he remains in talks with other teams and it is possible the Sox could make another deal before either Spring Training opens or before Opening Day. The Brian Dozier trade speculation may not be finished yet, as Twins chief baseball officer Derek Falvey told reporters (including Mike Berardino of the St. Paul Pioneer Press) that “You can’t rule out anything. We constantly need to stay open-minded to potential opportunities to add value.” That being said, Falvey also added that “as it stands, Brian is here today and we’re excited to have him as part of the Twins family.” Minnesota reportedly asked teams to make their final offers for Dozier at the start of January and a heavily-rumored trade with the Dodgers failed to materialize and L.A. instead acquired Logan Forsythe to play second base. Since Dozier is under contract for two more seasons at (given his production) a bargain price, the Twins aren’t under much pressure to trade him immediately. Mike Napoli could be a good fit for a Twins team looking for both veteran leadership and another bat, FanRag Sports’ Jon Heyman opines. Napoli could split time with Joe Mauer at first base and DH, and Heyman notes that Napoli has past ties to both GM Thad Levine and chief baseball officer Derek Falvey. This is just my speculation, but I’m not sure if Napoli would be interested in joining a team that isn’t close to contention, though obviously Napoli’s priorities might change the longer he remains unsigned. 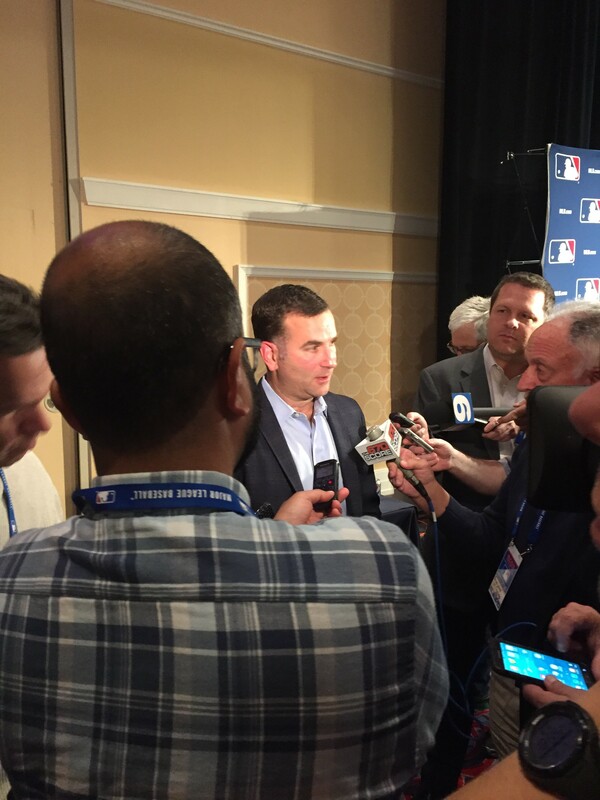 After a whirlwind stretch of about 27 hours in which he traded franchise cornerstone Chris Sale and one of the game’s best all-around outfielders in Adam Eaton, White Sox general manager Rick Hahn expressed both the difficult and emotional nature of the decisions as well as the optimism he had about his organization’s future at a press conference at Major League Baseball’s Winter Meetings. Having traded Sale for prospects Yoan Moncada, Michael Kopech, Luis Alexander Basabe and Victor Diaz yesterday, Hahn acquired right-handers Lucas Giolito, Reynaldo Lopez and Dane Dunning in this afternoon’s Eaton trade. Though the front office was seemingly all on board, Hahn didn’t characterize that as an easy consensus to reach. Trading a player with five years of remaining club control was understandably characterized as a difficult decision to reach and one that at times was the source of some debate. In the case of Eaton, that was three right-handed pitchers that Hahn termed “potential front-end-of-the-rotation fixtures.” The White Sox entered negotiations with high expectations and didn’t merely sell to the highest bidder, Hahn explained, and that’ll be the manner in which he continues to operate as he fields interest in other players on the roster. Names like Todd Frazier and Melky Cabrera represent short-term assets (free agents next winter) that could potentially be explored in deals, while others such as David Robertson (two years of control) Jose Abreu (three years) and Jose Quintana (four years) could merit larger commitments due to the fact that each can be a long-term (and reasonably priced) solution for an interested party. Unsurprisingly, Hahn didn’t make mention of any specific players he’s already discussed or plans to market to other clubs, but he made no secret of the fact that the Sox hope to again find themselves in a position to receive a trade offer that they feel too strong to rebuff. Though five of the players that they’ve acquired since Tuesday morning are pitchers, the White Sox weren’t specifically focusing on high-end pitching prospects when negotiating with other clubs. The Sox pursued the best prospects possible, regardless of position, according to Hahn. The end goal, he further explained, is to develop enough of a base of talent that the Sox don’t need to be so reliant on a top-heavy roster. In recent years, the White Sox haven’t had the “one-through-25 depth or even the one-through-40 depth” that a team needs in order to play at a championship level, Hahn opined. And, depending on how the remainder of Chicago’s trading efforts work out, there could be further ripple effects on the Opening Day roster. The White Sox now look at Cabrera, Charlie Tilson and Avisail Garcia as their starting outfield alignment, according to the GM. Further subtractions throughout the roster, though, could lead the team to “augment” the roster as Spring Training approaches. If the Sox don’t have the requisite upper-level depth to fill a void or if the team doesn’t wish to rush a prospect to the Majors, it seems reasonable to expect the Sox to pursue a veteran option that could serve as a bridge to younger talent. Over the past few years, Hahn has been used to speaking at press conferences in which he’s announcing a newly acquired addition to his Major League roster with an eye toward contending, making the past few days somewhat uncharted territory for the South Side GM. During an appearance on WSCR Radio’s “Inside The Clubhouse” show (hat tip to CBS Chicago’s Bruce Levine), White Sox GM Rick Hahn said that discussions with manager Robin Ventura and the coaching staff about their futures with the team will wait until the end of the season. While the Sox have had another underachieving season, the lack of talk isn’t necessarily a sign that Ventura and company could be in trouble, as “we had the same conversations a couple of years back, when he was in the last year of his deal that time,” Hahn said. “Even as a player, [Ventura] played out the last year of his contract, and focused on the end of that particular season. He let the contractual stuff go until the end of the season, and that is our plan at this point.” Ventura quietly signed a two-year extension during the 2013-14 offseason, prior to his last season under his previous contract as Chicago’s skipper. Could the qualifying offer keep Mike Napoli in an Indians uniform? Paul Hoynes of the Cleveland Plain Dealer floats the idea that the Tribe could extend the one-year QO (rumored to be worth $16.7MM) to Napoli as an attempt at keeping the slugger in the fold without making too lengthy a commitment to a player with a checkered injury history and who is entering his age-35 season. Napoli has enjoyed an outstanding season (.253/.339/.515 with 28 homers in 442 PA) and could certainly be in line for a multi-year deal this winter. If Napoli feels the draft pick compensation attached to the qualifying offer could dampen his market, however, he could also accept the QO and remain on a contender he enjoys playing for, while still taking home a nice payday. It’s certainly one of the more interesting possible QO scenarios in play this winter, assuming of course that the qualifying offer still exists in its current form if the new collective bargaining agreement is finalized before the offseason begins. The Royals have disappointed this season, and rival executives tell Rustin Dodd of the Kansas City Star that the Royals could face a tough time reloading for another quick return to prominence. A lack of quality pitching in the system is one issue, not to mention rule changes to the draft and international spending that have made it harder for smaller-market teams like K.C. to stockpile talent. Dodd’s piece is well worth a full read for a look at what plagued the Royals this season and the challenges they’ll face in the future. After a disappointing 2014 season, White Sox GM Rick Hahn contemplated a complete team teardown. But once owner Jerry Reinsdorf opened his checkbook, Hahn “won” the offseason with a series of splashy moves — which ultimately added only three wins in the standings. This past offseason, Hahn again underwent some of the same soul-searching over the direction of the White Sox, debating everything from a complete rebuild to chasing some of the winter’s nine-figure free agents. Determining that the status quo wouldn’t get the White Sox into October and a teardown would set the franchise back, Hahn got to work. This time, however, the GM did so with a sneaky trade chased by a series of under-market signings (as MLBTR’s Tim Dierkes examined in his recent review of their offseason). With Cactus League games underway, Hahn takes time out to talk exclusively with MLBTR about his second consecutive busy offseason. After 2014, you “won” the offseason with some pretty pricey deals/trades, signing Adam LaRoche, David Robertson and Melky Cabrera and dealing for Jeff Samardzija. The holes to fill arguably were as big after 2015, but expenditures were much more modest. What changed? We certainly were “in” on several of the higher profile free agents this offseason, but ultimately we were unable to come to terms on a deal with which both sides were comfortable. It can be frustrating — especially from a fan’s point of view. However, there are several factors that go into these decisions – some of which are not economic-based. For example, whenever I see a guy choose to remain with an organization with whom he enjoyed success and with whom he is comfortable, I have to remind myself that we were the beneficiaries of such decision-making back in 2006, when Paul Konerko chose to re-sign with us over other suitors. Frankly, it’s more fun to be on that side of the choice. Did the offseason unfold pretty much as expected — striking hard with prospects to grab a super need in third baseman Todd Frazier, then filling in at a buyer’s market with Jimmy Rollins, Mat Latos and Austin Jackson? Given the need – arguably one that has existed for the organization going back to Joe Crede or, perhaps, even [manager] Robin [Ventura]’s playing days – the talent, and the impact he could have in our clubhouse, Todd was at the top of our target list. Converting on him was essential to executing our offseason plan. Some markets moved more quickly — like the catchers’ market — than others, like outfielders, and we had to respond to the pace accordingly. A couple of times we tried to speed things up. But in reality, the goal had to be to get the right mix by Opening Day, not by some artificial deadline, such as the end of the winter meetings or [January’s fan convention] SoxFest. In the case of Jimmy and Austin, at least, players chose the White Sox over as good or better playing opportunities and/or salary. Does it ever tire, getting guys who are psyched to be White Sox? [Laughing] I do like the idea of players electing to join us over other opportunities. We do our best to learn as much as we can about a player’s makeup before acquiring him, and some of our guys have certainly backed up their words about wanting to contribute to winning in Chicago being the most important factor in their decision-making. You have a super-plum prospect in Tim Anderson. What’s the best-case scenario for his arrival date? Given that he was coming out of a smaller program and had only really been playing baseball full-time for about two years, our original development plan for Tim contemplated full-season stops at every level. Based on the original plan, that would mean Timmy would spend essentially the entire 2016 season at [AAA] Charlotte. That said, the good ones have a way of forcing the issue or speeding up the timeline, so we’re going to remain flexible. Is there anything the White Sox are doing differently with Tim, in contrast with Gordon Beckham — likewise a first-rounder shortstop who sped his way through the Sox system — eight years ago? With regards to Beckham, one of the larger issues for him was that he never failed prior to getting to Chicago. Obviously, you don’t want a player to struggle at any point in their career, but there is something to be said for them learning how to dig themselves out of adversity. Those lessons are much easier to learn somewhere in the minors and away from the scrutiny of the bright lights of the majors. Since struggles are inevitable in the majors for every player, there is a fair amount of benefit for them having gone through it in the minors, which prepares them to be able to adapt and rebound once it happens in Chicago. The toughest call of the offseason had to be cutting ties with catcher Tyler Flowers [who had strong pitch-framing metrics]. Cutting him even briefly raised the ire of irascible-mode Chris Sale. On paper, it seems for roughly the same dough, your catching has gotten older and, at least defensively, worse. For a relatively conservative and loyal organization, the move surprised. Is your new catching platoon’s upside that high? We see a fair amount of upside in the combination of Alex Avila and Dioner Navarro behind the plate. Obviously, this club struggled to score runs in 2015, and we weren’t comfortable just bringing back the same unit and hoping it would be better this time around. From a defensive standpoint, both Alex and Dioner have received a great deal of praise from the pitchers who have thrown to them. While they may not post some of the framing numbers that we have seen in the past, considering the entirety of their offensive and defensive skills – which includes throwing out runners, pitch-blocking, and game-calling in addition to framing – we feel that it was overall a change that needed to be made. Shortstop Alexei Ramirez seemed an easier call, at least in declining his $10 million option. How close did you come to bringing him back at lower AAV, or was a change of scenery the best for both sides? As with the Flowers decision, this was another area that we felt it was time to try something different. Alexei was a stalwart for us for many years; however, we weren’t just going to bring back the same squad and expect things to be different. No way around Avisail Garcia’s struggles last season, and you’ve often reminded us he’s just 24 years old. That said, what do you need to see from him this season — stats be damned — to feel good about committing to him in the future? Avi has a world of talent and as you noted, is still only 24 years old. This is an important year for him, and we’re looking for improvement in terms of his approach. He has the aptitude to execute the plan that [White Sox hitting coach] Todd Steverson has put in place for him, which fundamentally is about him doing more damage on his pitches and laying off those that aren’t likely to lead to good results. He has been working diligently on some mechanical adjustments that we think will make this approach easier for him to execute. Thus far, with the usual “it’s only spring” caveats [10 hits, two homers, 11 RBI in his first 23 Cactus League at-bats] – he has delivered. You have come across as doubleplus positive about Tyler Saladino, dating back even to his injury stints in the minors, and he was prepared to shoulder the starting shortstop role before you signed Rollins. In the case of both Tyler, who perhaps had cause to place a chip on his shoulder about entering 2016 as a starter, and Avisail, who had no cause for chip, what do you say to them now that their playing time almost certainly will be being squeezed by Rollins and Jackson? We’ve been clear both internally and publicly that playing time will be earned here, so there really is no limit on the amount of time that either of those players could play in 2016 if they are producing. Robin knows that the lineup card is entirely his, and he should play whomever he feels gives us the best chance to win on a given night regardless of contract status, seniority or pedigree. There are no scholarships. The White Sox, to their credit, simply do not rebuild. In my memory there has never been a teardown. Presumably it goes against the competitive instincts of you, Ken Williams, and all the way up to Jerry Reinsdorf. Is it a particular point of pride, entering every season with a true shot at a title? Certainly it our preference to compete for the next immediately-available championship. However, we do not intend to delude ourselves. Any time you have a disappointing season, you have to look at all of your options, and this offseason we certainly considered going the “full rebuild” route. In the end, we simply felt we were closer to winning a championship by adding to the core we had already on hand than taking it down to the brass tacks and trying to reassemble a new core in the future. If for some reason we fail to meet our expectations again this season, it will be on the table once again next offseason. There seems to be a lot of ninnied handwringing about the so-called “window of opportunity,” a.k.a. without Yoenis Cespedes you’re wasting Chris Sale’s prime. While not ignoring that one day Sale might be soft-tossing like Mark Buehrle, if you’re going for it every year, is the “window of opportunity” a false premise? I actually do believe in success cycles, or windows of opportunity. However, there is more than one way to put yourself in a position to take advantage of an opportunity to win. There are certainly risks in terms of clubhouse mix or chemistry that we would not take. However, if we based those decisions strictly on reputation or hearsay, as opposed to trying to get to know the player and his motivations directly, we likely would have missed out on a number of players who played large roles in our success over the years. A.J. Pierzynski and Bobby Jenks come to mind, to name a few. How important is it to see a guy like Adam Eaton excitedly tweet positive messages after you sign Jackson, who is likely to push Eaton to a corner outfield spot? We certainly have made an effort over the years to target team guys who prioritize winning. The fact is that I would expect every guy on the club to say that same thing. When you see recent comments like those made by Eaton, or Rollins and Jackson about their decisions to sign with us, it reinforces that our scouts are doing a great job evaluating character as part of their reports. Fans can tend to be irrationally possessive of draft picks, certainly in reference to losing one to sign a free agent. Is this a silly worry, in that there literally is no free agent you would ever consider talking to who’s not worth losing a pick over? Fundamentally, we are willing to sacrifice draft picks in order to make what we believe are significant improvements to the current club. While that did not happen this past offseason, we were in talks throughout the offseason that could have led to such. Plus, we did last offseason with Robertson and Melky. Is there a deal you most regret not making? The twisted part of this job is that you probably spend more time lamenting the deals that did not go the way you had hoped versus relishing in the ones that worked out. When things go well, it’s easier for me to see the scout, coach or analyst who made the recommendation or the positive contribution to helping the transaction work out than it is for me to see my role. When it craters, I feel the responsibility for the poor decision gone awry. This year shapes up to be a tight Central Division race. Team you most want to beat: Royals, Tigers, Twins, Indians — or Cubs? It’s all about winning the division. While we certainly want to win every night and there is heightened fan and media attention surrounding the crosstown series, the fact is beating the clubs in our division gets us much closer to our goal than taking games from a NL club. In this day and age, do the White Sox have anything near a “number” that ends up being assigned to a player? We fans have WAR now, in spite of whatever imperfections and controversies; do the White Sox have their own secret sauce that breaks things down similarly, beyond the 20-80 scale or eye test? We do not look strictly at one all-encompassing number. We look at a bunch of different metrics that we trust and combine it with the subjective evaluation. Best movie shot at [Hahn’s high school] New Trier: Home Alone, Ferris Buehler, Uncle Buck, or Sixteen Candles? I’ve got some built-in biases here. First of all, I currently live in the hometown of Joel (Tom Cruise) from Risky Business. Second, while not filmed at New Trier, The Breakfast Club was loosely based upon New Trier’s detention system, and I, myself, served time in a breakfast club or two during my high school career — although I only incurred a weekday before-school penalty or two along the way and never the full-day, weekend sanction showed in the movie. In the end, I have to go with Ferris Buehler given how much of the city is covered, but those other two are close behind for me. So, then: How freaking cool is it to be a major league GM? This is something I truly to hope to do a better job of appreciating this season. It’s a pretty fantastic opportunity – especially being able to do it in my hometown – but frankly I need to do a better job enjoying the victories along the way.